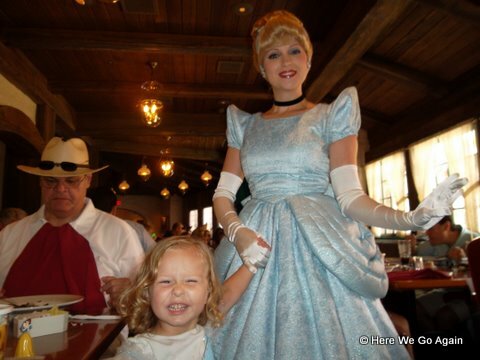 The main event of today was a Princess Storybook Lunch at Epcot.Â (In Norway, if you are interested. )Â Elizabeth was…well, I don’t know if there is a word for what Elizabeth was. Elizabeth doesn’t look particularly happy in this picture, she was, but I think her expression is more of an OH MY GOODNESS CAN YOU BELIEVE THIS? And my new camera stinks.Â Okay, probably my usage of it stinks, but this blurry picture of Elizabeth and Aurora was the best one I got.Â Elizabeth talked to her, showed her the little plastic princesses that she was playing with, and hugged her. As Elizabeth was dressed as Cinderella, everyone assumed that Elizabeth’s favorite princess was Cinderella.Â Technically, Elizabeth was dressed as Cinderella because we own a Cinderella costume.Â (Shout out to Saag and Naan for the Cinderella costume! 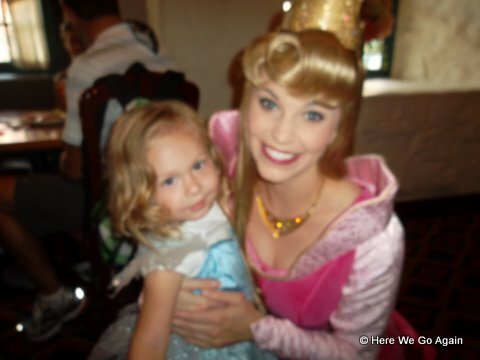 )Â But Elizabeth is a big fan of Cinderella.Â So when Aurora moved on to the next table, she told Elizabeth that her friend Cinderella was right behind her.Â Elizabeth was vibrating from excitement. 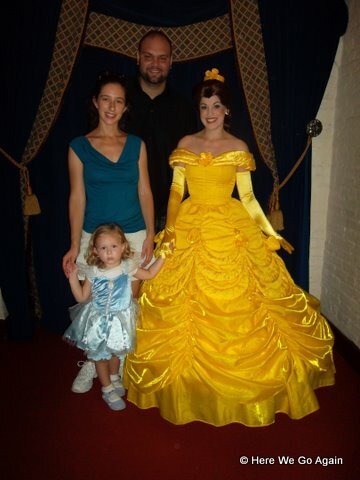 Then Cinderella came out.Â Elizabeth moved from happy to LEVEL FOUR HAPPINESS STAGE EIGHT. Lunch was delicious and a tremendous amount of food and had a delicious dessert that made me wish I had skipped lunch.Â I ordered some kind of Norwegian meatballs.Â Matt had a roasted chicken breast thing.Â I ordered the children’s salmon for Elizabeth and the waitress looked at Elizabeth, looked back at me, and said “the salmon?Â Really?Â We only keep that on the children’s menu to seem fancy.Â No one ever orders it for their children.”Â Okay, actually she said “what?”Â But I could tell that is what she meant.Â Elizabeth did eat a rather good portion of her salmon.Â (Or, as the Jen marketing department refers to it, “pink fish.”)Â Or as much salmon as a vibrating from excitement toddler can eat when there are PRINCESSES IN THE BUILDING. Right before we left, they had all the children get out of their chairs and held a tiny parade around the room.Â Luckily.Â Because Elizabeth had been trying to fling herself out of her chair and saying things like “I just want Ariel to come back and meet me again!Â I just want Ariel!Â PLEASE!Â ARIEL!”Â And Ariel was the closest princess to us and following Ariel through the room was good enough.Â They played music and all the princesses (and Mary Poppins, who- correct me if I am wrong- is a nanny, not a princess) carried flowers and walked elegantly. 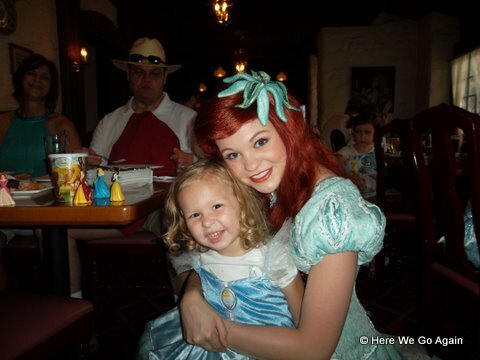 And Elizabeth cried when we left lunch because she just wanted to see Ariel and hold some flowers.